ChemSW announces IMCS Pro Web, an enhanced version of its leading laboratory equipment tracking system. ChemSW announces IMCS Pro Web, an enhanced version of its leading laboratory equipment tracking system. 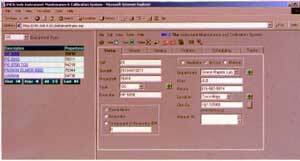 This web upgrade enables use of the program from anywhere at any time, using Microsoft's Internet Explorer* browser. IMPS Pro, in use for over five years, is a high-performance, Windows*-based program that helps customers maximize lab equipment investments. IMPS Pro Web tracks instrument history, including where and how it has been used and by whom, any problems that have occurred and maintenance that has been performed. The product is particularly valuable in GLP-compliant settings, where accurate verification of instrument calibration is required. The web-enabled program delivers significant time and cost savings by eliminating the need to configure individual workstations throughout the company with the system software. "ChemSW continues to be at the cutting edge of information technology, bringing our customers new software versions that can be used over corporate intranets or the Internet," comments Brian Stafford, President of ChemSW. "Our new web-enabled software helps customer companies standardize their systems and provide wider user access." ChemSW, Inc., 420 F Executive Court North, Fairfield, CA 94585. Tel: 707-864-0845; Fax: 707-864-2815.